Wind Power Law Blog | Legal developments regarding wind energy or power: siting, zoning, environmental, permitting, finance, interconnection, turbines in New York and the United States. Forty-eight wind projects (including two Long Island Cable projects) are in the NYISO queue to ultimately connect to the state’s electric grid. These projects represent a total of almost 7GW of summer peak production, and have an average size of 144 MW summer peak production. The numbers are relatively high owing to the scale of the few offshore products in the queue. Here for a full table of current wind projects in the NYISO queue. (April 1- New York) In a move sure to unsettle some residents, the Town of Marlboor, New York has approved a wind farm project with turbines made to look like cigarettes. 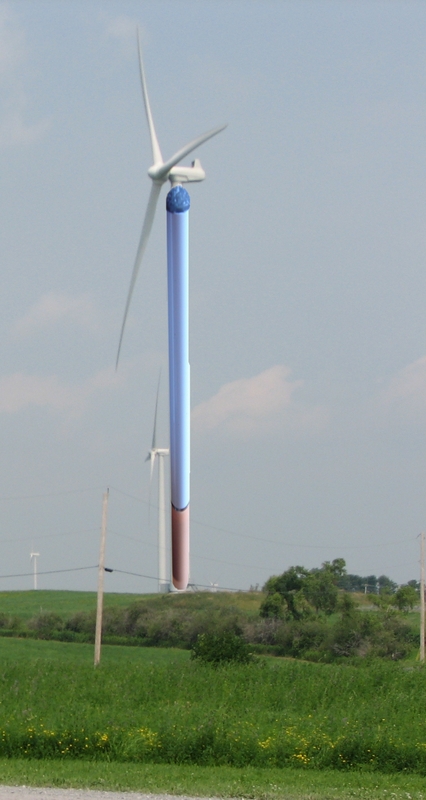 In a bid to raise money for town coffers, the town agreed to allow the turbines to be painted to resemble electronic cigarettes made by the NoSmokeSmokes Corp. Representatives of NYISO were unavailable for comment as to what impact on the grid the mass plugging in of electronic cigarettes may have. NoSmokeSmokes estimates that for every 10MW of power generated, the ingestion of 10M mg of tar will be avoided. [T]o fully utilize [Texas] energy resources, the State needs authority to regulate wind to mitigate wasteful practices, and landowners need a legal property interest in wind that they can market or develop and that courts will recognize and protect.Yet under current law it is unclear whether the State has full regulatory power over wind as a property interest severable from land, and whether wind ownership is incident to land ownership. … whether wind is considered a “natural resource” like oil or groundwater,24 such that the Texas Legislature can pass laws to regulate it under the Texas Constitution. … whether wind is subject to ownership in Texas. … whether a landowner’s interest in the wind that flows over his land is severable from the surface estate. Mr. Alexander argues “that the Texas Legislature should pass laws clarifying that wind is a natural resource under the Texas Constitution, and that to promote ‘[t]he conservation and development’ of wind as a natural resource, the Legislature should statutorily recognize wind rights as an interest severable from land ownership. From: SSRN-The Texas Wind Estate: Wind as a Natural Resource and a Severable Property Interest by Alan Alexander. Washington Post’s Ann Hornaday reviews “‘Windfall” documentary about the local conflicts engendered by a wind project in Meredith, N.Y.
via Ann Hornaday reviews ‘Windfall’ – The Washington Post.